This is a collection of open source fonts that I have been working on recently. All are licensed under the SIL Open Font License (OFL), which means they are free to use (in print and electronically), redistribute, and even modify. News Cycle is a realist sans-serif typeface based on specimens from ATF's 1908 News Gothic (created by ATF chief designer Morris Fuller Benton). The goal is to produce a practical, easy-to-read font suitable for journalistic use at multiple weights. 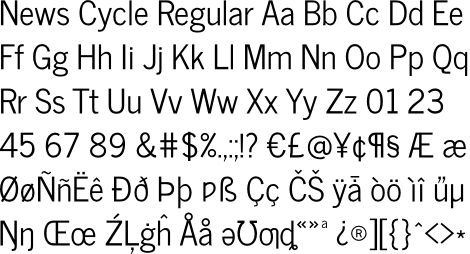 News Cycle is currently available in regular weight, covering Unicode Latin-1, Latin Extended A and Latin Extended B. The development version of News Cycle currently incorporates two significant changes over the stable release. First, it adds Cyrillic and Greek character sets, which are intended to harmonize with the original Latin design. Second, it adds a true italic, rather than a simple slanted "oblique." ATF New Gothic, on which News Cycle is based, did not feature a true italic, so this design is my attempt to fashion something a tad more eye-pleasing than an oblique, but which does not look drastically out of place on the same page as News Cycle Regular. To avert undue pain and suffering, the beta version is currently only published as a UFO font. Della Respira is a revival of ATF's Della Robbia, an art-deco era typeface designed by Thomas Maitland Cleland. The name "Della Robbia" is a reference to Florentine sculptors Andrea and Luca della Robbia (and perhaps other members of the family); Cleland's inspiration was Florentine inscriptions from the time that the Della Robbias lived. My revival, so far, only attempts to recreate the regular weight. There was also a light version. What I find more interesting, though, were the intricate capital ornaments. I have started to add those to Della Respira, but only time will tell if time permits me to complete that project. In the interim, the released version does feature some nice swash variants. Bodega Script is still in development. It is a revival of ATF's famous Brush Script. As with my other revival efforts, the end goal is to extend the character coverage and to provide a usable open-source implementation. 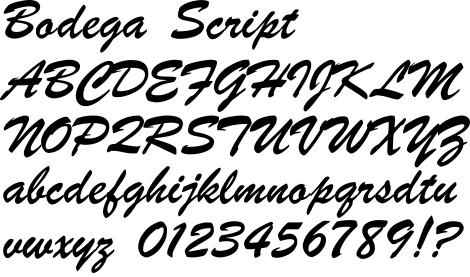 You can download Bodega Script in OTF form, but it still has quite a few rough edges, paricularly since it is my first stab at a script face. Click to follow this news feed to get updates whenever there's a thrilling new development. It originates from my work blog, which otherwise does not interest you in the least. Help further the development of this font by sending the project an old-fashioned pittance. Just five measly bucks (US) draws a shiny new glyph, though every little bit helps. You can also help support this project *and* make your friends envious by purchasing a rare & stylish Glyphography t-shirt. Who knew promoting open source could look so good?